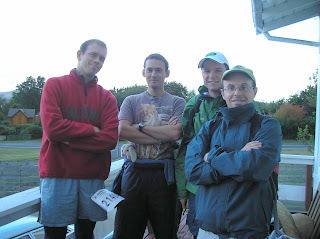 Last weekend three friends (James, Nick and Myles) and I assailed the Oxfam Trailwalker 36 hour 100km challenge. The training this year was a step-up on last year. I was healthier before the training and the training was more intensive with regular weekend walks and two weekend overnight walks. The weather was predicted to be messy and unpleasant - but it never really eventuated. What we got was ideal walking weather, predominantly overcast, a cool breeze and occasional light rain. The only uncomfortable times were when we stopped at the checkpoints during the night and felt cool. Unfortunately, 3 days before the event I came down with a heavy cold. This didn't impact the walk much except for ruining my sleep before the event. The fact that it didn't interfere with the event is curious. I was coughing before the event and, even now, after the event but not during the event. I was rarely out of breath. We assembled at 7:45am at the start line with all the other competitors... er... participants and prior to the start horn unleashed our hourly chant for the first time: I'm ALIVE, I'm WELL and I FEEL GREAT! which silenced everyone for a moment. It was cathartic and energising to do it on the track and also hopefully an inspiration for those nearby. Leg 1 (14.7 km): Unlike last year we had a fixed strategy: we aimed to do the circuit at a more leisurely pace. This was illustrated well by the fact that after the start, we were the last team. The bunch was huge but we lagged quietly behind. That in itself was a huge relief. I remember last year being in that pack - the speed and enthusiasm there at the start had not helped us 50 kms down the track. The leg, though featuring a river walk and craters of the moon was rather unexceptional. I could walk it in sneakers as it was flat. We cruised into the first checkpoint comfortably and perhaps second or third to last. Leg 2 (12.9 km): The first challenging leg took us into the hills and was my favourite. I had changed into my tramping boots to adapt to the riskier terrain. Last year I chose to wear only sneakers so to reduce the impact on my ankles – the result ironically being sore ankles. The track ascended gently through a quarry and then higher onto a ridgeline - the highest point on the track. The wind was refreshing and we slowly gained and passed some of the other teams. By checkpoint 2, we were moving freely and enjoying it. Leg 3 (10.5 km): This leg I started to feel the beginnings of muscle fatigue. My ankles were increasingly sensitive and my lower calf had locked solid. Often, when walking small pains and strains develop and then often could be 'walked out' and I hoped that these two were such. We kept at our gentle strolling speed and navigated (once wrongly) through the agricultural land. This leg was marked by our first encounters with incomplete teams – teams where a member or two had pulled out. We cruised into checkpoint 3 in the late afternoon. I requested that we spend a little longer at the checkpoint so to give my various sore spots a chance to have some treatment. Leg 4 (19.4 km): The sun went down and the torches went on as the longest leg begun. This was the killer for me last year as a road segment had aggravated my ankles so much that I could only manage another leg. This time I was healthier and they also had done me the service of altering the course by going over farmland rather than along a road. That being said both my ankles and the lower calf problem were still there and I made a comment to the effect that I felt like I was in a familiar situation to last year where if my pains were to get any worse I'd have to take each checkpoint as they came. In the middle of this leg, Nick offered to massage the area which helped considerably. It was then that the diagnosis was obvious - it was just lactic acid. I had to stop for another reason later on: the ankle strap felt like it was cutting into me. I had walked with the ankle strap since the second leg to give extra support on the less even ground. Walking without it left my ankle more vulnerable but it would have to be done until the next checkpoint where I 'taped' the points that were getting rubbed and then put the strap back on. Leg 5 (7 km): The shortest of the legs and a good thing too after the monster leg previously. It was primarily a pine forest walk, the only quirk being the non-ending. You see the checkpoint 50 metres away but have to turn left and descend a circular path, leading to a tunnel and then follow an ascending path that eventually leads you to the checkpoint - some 5 minutes of extra walking! My ailments had mostly lessened although my calf and achilles tendon were of some concern. This checkpoint is the best equipped - complete with warm food, cookie time cookies and a physiotherapist. The physio told me that the back of my tramping boots was rubbing my achilles tendon - a common problem apparently. Leg 6 (7.2 km): Another short leg - and the least inspiring. It was just farmland and then an industrial area. But for the time of night (between 3 am and 5 am) it didn't matter. It was a lull in the conversations too as we all turned inwards. We got to the next checkpoint for another rest. I went through my maintenance routine but following that found my arches (the instep) was quite tender. This was a different kind of problem related to my flatfootedness. The orthotic insoles I wear press into the foot onto muscle and bone and it seemed after 71.7 kilometres, the right foot's arch was quite aggravated. In hindsight, one of my mistakes was not to change back into my trainers for leg 5 and 6. Both of the short legs had flattish ground and could easily have been done without tramping boots. This would have reduced the hammering on the arch as well as the rubbing on the achilles. I asked James what the next leg was like last year and he said it had been mostly roads so I switched to my trainers at this point. This was my second mistake as I should have checked the map. They had changed the route and it was going into the hills. We left prior to sunrise. Leg 7 (14.8 km): This was the second longest leg and second to last. We ascended farming land. It was nice to go uphill again but I was regretting changing my shoes. James reported real discomfort for the first time, in both of his lower legs. We slowed down, which was fine with me, as now both of my arches had become painful. The only relief was going uphill as I could put my weight on my toes and due to the angle, stretch my whole foot, relieving the pain. There is a downside to going uphill though. We came out on a road and then went downhill where I asked for another break (or two). We came out onto farming land and had a shock announcement that James was to retire from the event. It seemed a prudent decision as to walk further would be to risk further injury and he is to participate in a marathon soon. We rested, he received a massage from Nick and then we went to the nearest road where James was picked up. We went onwards and for me the last 3 kilometres were a relief. My right arch cooled down and I could move freely. We cruised into the checkpoint at 11:23am. Leg 8 (13.5 km): We had decided to have breakfast at this checkpoint. I was busy doing necessary maintenance, but when I sat down to have breakfast I felt a little nauseous. During breakfast a guy, Graham, came over and asked whether he could join our team for the last leg, which we agreed to. We suggested a departure time, which I disagreed to. This was my final mistake. I needed more time to rest. My stomach was not ready for food and I probably should have just asked for an extra 10 to 20 minutes to lie on my back with my feet on a chair (I had done this at every other stop). I hadn't given my feet a chance to relax and be stretched, but it was the last leg and it was rather straightforward, I thought, and at the end of the last leg I was moving quite easily. Anyway, I was wrong. Within 20 minutes of leaving the checkpoint, I had to slow down a little bit as both of my arches were getting too much for me. Intriguingly there was no pain in my ankles, just agony in the arches. I tried to drink my ginger tea, but felt more nauseous after that. So after trying that I didn't drink or eat anything. I decided to just focus on one-foot-in-front-of-the-other and ask for breaks when required. That was the only strategy. When you're in pain like that you also have two options, either focus 100% on walking and shut the rest of the world out, or to distract yourself with conversation. I relied primarily on the former. And it took me to the finish area. 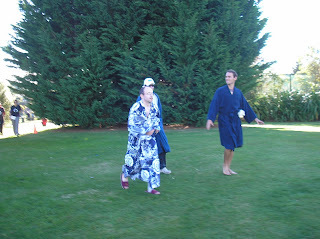 We donned our costumes and I changed my shoes for slippers. Finally being without the insoles, I decided on the spur of the moment to start a jog with the team (I hope you didn't mind Myles). It felt like we were running fast but I'm sure it just a dawdle. And we past through the finish line. Hugs all round. Got my medal. Got a goodies bag. Cheered the ZenWalker2 team as they came through the finish line. And then after a moments hesitation, checked myself into an ambulance. I lay down on a stretch as blankets were put under my feet. That was good. I may have made a groaning sound of relief and a few of those embarrassing uncontrolled tears ran down my cheeks. Unsure of the groan, the nurse quickly checked my blood pressure but was happy to find I hadn't expired and that my blood pressure was actually quite normal. She diagnosed me as physically 'hammered'. I limped back to the team and went back to Andrew's home. I found I could eat and drink once more and found my first sleep in 34 hours. Right now I am mostly fine. My achilles is still a little big. I have impressive blisters on my little toes but other than residual stiffness and a dislike of stairs, I'm great. I learnt a lot about my body and walking strategy while on the track. And oddly, I might consider taking part again next year with an idea to do it more comfortably as well as continue support for the charity and keep fitness up. 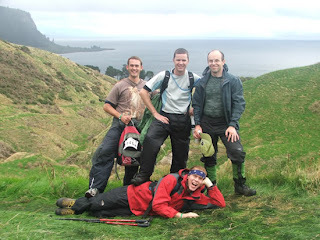 Thank you mostly to my three walking companions, James, Myles and Nick. Thanks again to Myles for the photos above. A big thank-you to the support team of Andrew, Olivia, Angel, Alex and Mimi. Especially to Andrew who lent use of his home and car. Thank you sponsors for your generosity - it did motivate me on the track. Thank you Xin for your tolerance of my weekly training and finally thank you Oxfam for the wonderful event and the work that you do.